There are a lot of views on breeding working dogs. We do "line breeding" on occasion, we are generally against inbreeding as we think it causes far more damage than advantage, especially several generations down the road. In cases where a breed has a limited gene pool to start with, it can eventually lead to serious destruction of the breed. In simple terms trying to replicate the same dog over and over again is neither really possible, nor is it necessarily a good idea. Looking for positive traits is a different story. It is also appropriate to remind everyone that many famous dogs came from virtually unknown lines, and yet they proved to be excellent. This tells us that some how, dogs were and are born that are not the product of either "line breeding or inbreeding" There will be many people who don't agree with this. The subject however is quite interesting. Here are a few thoughts on the subject.Breeders often talk about inbreeding and outcrossing as though they were the only possibilities -- and generally with negative comments about the latter. There are other possibilities, and we have long been of the view that diversified mating is a good idea. It is not a theoretical concept that doesn't work in practice; I know several breeders who do it and achieve good results. This "blog" will attempt to explain why it is a good idea, but first we need to define the alternatives. Random mating is one of the assumptions behind the Hardy-Weinberg formula, which allows one to calculate the frequency of heterozygous carriers from the frequency of individuals expressing some recessive trait in a population. Because inbreeding among purebred dogs and in other small populations decreases the frequency of heterozygotes, these estimates may be higher than the actual incidence. In reality random mating in today's dogs is often the result of either accidents, "emotional breeding" where people like their dogs and think it is good to breed them, or breeding without adequate knowledge. Inbreeding is the practice of breeding two animals that are related (i.e., have one or more common ancestors). The degree of inbreeding may be assigned a value between 0 and 1, called the inbreeding coefficient, where 0 indicates that the animals have no common ancestors. Because the number of ancestors potentially doubles with every generation you go back in a pedigree, you eventually get to a point, even in a very large population, where there are simply not enough ancestors. Thus, all populations are inbred to some degree, and a true outcross (the term generally used when two animals are "unrelated") is not really possible. The term is generally misused to describe a cross between two animals with different phenotypes. Inbreeding does not change allele frequencies directly, but it does increase the proportion of homozygotes. Individuals homozygous for undesirable genes are likely to be removed from the breeding pool by natural selection (if they do not survive to reproductive age) or by man. Line breeding is a common term used for what is actually a particular type of inbreeding that often focusses on one ancestor who was considered exceptional. Particularly if it is a male, this exceptional ancestor may end up as grandfather and great-grandfather -- sometimes more than once -- in the same pedigree. Father-daughter, mother-son, and some other combinations also result in a disproportionate number of genes coming from a single ancestor. This type of close inbreeding is less common. [In contrast, the mating of full sibs or first cousins doubles up on two ancestors equally. In working lines we are seeing more of this type of line breeding, often in the first couple of generations the results appear quite positive, but by the fifth or sixth generation problems can arise. The extent of this has not yet been fully felt or understood. It is therefore difficult to comment fully on the benefits of this approach. As the result of several common practices, most pure-bred domestic animals are more inbred than they really need to be. One reason is often that some breeders own a small number of animals and breed only within their own group. A second is that many breeders have the idea that outstanding animals can be produced by inbreeding -- by doubling up on the good alleles while somehow avoiding the bad. Even if you were to point out that this is a gamble, such breeders might respond that they are simply helping natural selection. In other cases the approach and thinking is frighteningly simplistic and lacks even the basic understanding of what drives genetics. We have seen one relatively well known breeder happily explain that with line breeding, the offspring derive 60 percent of their characteristics from the mother. This is of course wong ! In considering breeding it is also necessary to consider environmental and actional impacts on the development of a litter of puppies as opposed to pure genetics. A genetic proclivity towards a given trait is one thing, but exposure and environment have a major impact on what a puppy actually becomes. Beyond the conventional close-relative inbreeding, there is another practice that has much the same effect, namely the popular sire phenomenon (generally over-use of a well-promoted champion). In fact, many who breed to such a dog believe they are doing a "good thing," as they will be increasing the frequency of occurrence of the genes that made him a champion. What they may not realize is that they are increasing the frequency of all genes carried by this animal -- whether they are good, bad, or innocuous -- and that champions, like any other animal, carry a number of undesirable recessive alleles (the genetic load) that are masked by wild-type alleles. The result of the popular sire phenomenon is that almost all members of the breed will carry a little bit of that famous dog, and any undesirable trait carried by the famous dogwill no longer be rare. Finding a safe, unrelated mate then becomes very difficult indeed. If we lived in a world where all the genes followed the simple rule that there may only be good alleles, which are dominant, and bad alleles, which are recessive, then inbreeding could be an effective tool for improving a breed. However, during the past 25 years, geneticists have been directly measuring genetic diversity in populations by looking at the DNA or proteins, rather than at the phenotype. They have found that many individuals who cannot easily be distinguished by their phenotypic appearance nevertheless have considerable differences in their genotype. Some of these alternative alleles (termed neutral isoalleles) are functionally equivalent. Others have lost only a small portion of their normal function. Suppose we have a "mutant" allele that has lost only 5-10% of its normal function. In many cases, this would not produce a noticeable effect. If you made an individual homozygous for this allele, you would not even be aware that you had done so. Now consider that the same fate may befall a number of genes during an inbreeding program. Eventually, you will have an individual that is considerably less fit than one carrying the normal alleles for all (or even most of) these genes. There is no magic formula for regaining what you have lost. You must start again. About the only animals that are routinely inbred to a high level are laboratory mice and rats. 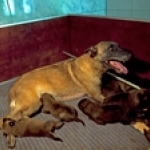 There, the breeders start breeding many lines simultaneously in the expectation that the majority will die out or will suffer significant inbreeding depression, which generally means that they are smaller, produce fewer offspring, are more susceptible to disease, and have a shorter average lifespan. Dogs are no different. If you can start with enough lines, a few may make it through the genetic bottleneck with acceptable fitness. However, dog breeders generally don't have the resources to start several dozen or more lines simultaneously, or unfortunately are more concerned with economics and do not wish to commit the resources. In the long term this is not good for breed improvement. Sometimes two different alleles may be better than one. Consider the major histocompatibility complex (MHC). These genes are responsible for distinguishing "self" from "foreign", and a heterozygous individual can recognize more possibilities than a homozygous one. Having a variety of MHC alleles is even more important to population survival. Not only does this provide better defense against pathogens, but there is growing evidence that parents who carry different MHC haplotypes may have fewer fertility problems. This is not a universally accepted theory, but today one is hard pressed to find a conservation or zoo biologist concerned with preserving an endangered species who would not list maintaining maximum genetic diversity as one of his/her primary goals. This type of mating is the mating of individuals that are phenotypically similar. It is a normal practice, to some degree, for humans and various other species. Though phenotype is a product of both genotype and environment, such individuals are more likely to carry the same alleles for genes determining morphology. If we are talking about a conformation that is basically sound from the structural point of view, the genes involved will have been subjected to natural selection for thousands of years and will most likely be dominant. The major characteristics that set one breed apart from another will likely have been established early in the breed's history. ("established" means that there is only one allele of present in the population. If there is only one allele, the question of dominance does not arise.) Consequently, when you look at a dog, you are looking at his genes. If the conformation (or, for that matter, the temperament, intelligence, or whatever) is not good, then you are very likely looking at a dog or a breed that is homozygous for one or more recessive alleles that you would probably like to get rid of. If it is the dog and not the breed, you may elect not to breed him, or you may look for a mate that covers the problem. If it is the breed, the only solution would be to introduce some genes from another breed. (That would be a real outcross!). This practice is not uncommon in the KNPV line working dogs one see's in Holland. It is however done rather subjectively based on "gut feel" rather than science. Still the results have often been good. Breeding together animals that share dominant good alleles for most of their genes will produce mainly puppies that also carry these genes. Even if the parents are not homozygous for all these good alleles, you should still get many that are suitable. More important, if animals heterozygous for certain genes are more fit, assortative mating will preserve more heterozygosity than inbreeding. However, unlike inbreeding, assortative mating should not result in an increased risk of the parents sharing hidden recessive mutations. Though we might like to eliminate deleterious recessives, everyone carries a few. Trying to find the "perfect dog" without either visible or hidden flaws is like playing roulette. There may be a big winner out there, but not very often. The more you try to cover the deficiencies in one dog with good qualities in another, the less the dogs will have in common. If, then, the results are unsatisfactory, they should not be blamed on diversified mating, as that is no longer what you are doing. Think of genes as recipes. They carry the instructions for the various components that go into making up an organism. Each recipe specifies a particular component, and different individuals may carry different versions of the same recipe. (In the jargon of genetics, we say that they carry different alleles of a particular gene.) Individuals within a population often carry similar or identical recipes. Thus there are generalized similar characteristics within a given breed. We see this clearly in behavior patterns, some breeds retrieve, others are great jumpers, some have high prey drive. Try as we may with certain breeds you will not make a Malinois out of a Dalmatian. Still, given the amount of line breeding and inbreeding that has occured in canine populations there is more diversity among mammals than among carnivores, more among the carnivores than among the Canidae, and more among the Canidae than among the wolf group. An organism carries a collection of recipes, and the collection defines the organism. The great diversity in the possible collections of recipes is the reason for the great diversity in the animal and plant kingdoms. The more closely related two individuals are, the greater the similarity in their collections. The number of combinations is huge, and during evolution, the recipe collection was undoubtedly reshuffled many times. The combinations that worked well survived and multiplied. Those that did not work quickly died out. As time passed, exchange of recipes became difficult between animals that differed substantially in their physical and behavioural characteristics. Different groups, therefore, became constrained to work with only a subset of the total possible collection of recipes. One definition of a species is that members of two different species bred to each other cannot produce a fertile hybrid. However, a more modern definition is that two species are geographically, physiologically, or behaviourally isolated such that they do not normally produce hybrids. Additionally, they should have features that differ sufficiently to allow them to be distinguished from each other. The domestic dog, wolf, coyote, and jackal can all mate with each others (barring size constraints) to produce viable and fertile hybrids. Yet, they have been considered different species (within the genus Canis) because they normally live in different places, behave differently, and can usually be told apart. (Though there has been a recent move to change Canis familiaris to a subspecies of Canis lupus.) However, a jackal will not mate with a dog unless they have been raised together from pups (presumably due to a learned behavioural difference). Furthermore, no Canis species can produce a hybrid with a fox. This is not because the kinds of genetic recipes are greatly different, but because foxes do not share the same number of chromosomes. (In other words, their recipes are filed under a different, incompatible system. Genetic recipes may get modified when they are passed on. Many of the modifications will make no noticeable difference, or only a very subtle one. Some may improve the recipe and others will not. If we are making a chocolate cake and a critical ingredient is forgotten, or the cake is baked too long or at the wrong temperature, we end up with a disaster. (If we don't understand what has gone wrong, we will likely throw out the recipe and look for a new one.) We may even make deliberate modifications in an attempt to get a more memorable cake. Among the "chocolate cake" population, there will be a variety — or diversity — of recipes and, therefore, of cakes. This is not necessarily bad ! To have the potential for evolution and adaptation, we must risk the possibility of the bad. That is the "cost." In a large, naturally breeding population, we will end up with a number of versions (alleles), some so slightly different that we will never notice, some perceptibly different (but still functional), and some that just don't work at all. However, if we remove the diversity we lose the potential for evolution and for surviving unexpected change. To have the potential for evolution and adaptation, we must risk the possibility of the bad. Geneticists call that cost genetic load. This "bad" group persists because every individual carries two copies of every recipe, and often having just one "good" copy is enough for normal function. In most populations, every individual carries a portion of the load — three to five bad recipes out of several thousand. The load is so well distributed that if two individuals compare their recipe collections they will generally not have two copies of the same bad recipe. Suppose we start a new population with only six or eight founders. (A number of breeds have started with that few.) We will get rid of hundreds of bad recipes, but the remaining dozen or two will be encountered much more frequently. Furthermore, if there are several good or excellent recipes, the chance of dropping one of these from the collection grows greater as the number of founders diminishes, and the risk of losing one remains high as long as the effective population size remains low. Working with small numbers will inevitably decrease the diversity, simply because individuals do not pass on their recipes equally to the next generation and some recipes are accidentally lost. This has the superficially desirable result of giving a more reproducible phenotype, but at the expense of an overall reduction in quality, health, and longevity. If breeders had the ability to recognize each individual recipe and choose only those that were excellent, breeds could be produced with a small number of individuals that lacked genetic problems. However, what we see (the phenotype) is the product of all the recipes and, for the most part, we cannot distinguish the individual recipes. Moreover, we do not have the option of selecting recipes individually. When we select an animal for breeding, we are forced to accept a complete set. Even in those few cases where we now have a DNA test for a bad recipe (allele), we do not possess the ability to correct or selectively discarded it. We are therefore forced to work around it, or to discard the whole collection, with the attendant risk of discarding something excellent along with it. This is important to recognize even when a breeder thinks that they are eliminating PRA, dysplasia or some other undesired disease. The common practice of almost everyone rushing to breed to the currently-popular male show champion or excellent working dog is probably the most significant factor reducing whatever diversity remains. Consider your own breed (the situation for most breeds is similar). Can you find one or more males that appear in most pedigrees? Almost everyone decides they like the recipes of (insert name) — or at least the ones they can see readily — and abandons other recipes with little thought to the eventual consequences. In a few generations, almost everyone has a substantial number of his recipes, though not necessarily his exceptional ones, and many excellent alternatives are very hard to find. What is often called Mendelian genetics deals with the outcome of specific crosses. Population genetics deals with the distribution of alleles in a population and the effects of mutation, selection, inbreeding, etc., on this distribution. As a breeder, you are a practicing geneticist. A knowledge of both Mendelian genetics and population genetics is critical, not only to your own success, but also to the survival of your breed. Because many early geneticists believed that there were only two possible alternatives for a gene — "good" alleles that functioned normally and "bad" alleles that didn't — they expected to find little genetic variability in a population. The majority of individuals were expected to be homozygous for the good allele for most genes. But with the advent of modern biochemical and molecular tools, geneticists studying populations found far more variability (diversity) than they had expected. There are a number of possible reasons for this, and even the experts are not in total agreement on the most likely reason(s). However, geneticists have also discovered that populations lacking genetic diversity often have significant problems and are at greater risk from disease and other changes in their environment. The conclusion is that genetic diversity is desirable for the health and long-term survival of a population. Are purebreds dogs genetically diverse? Some may regard that as a contradiction in terms. The very concept of creating a breed with characteristics that are distinctly different from other breeds implies a certain limitation on diversity. Nevertheless, within the standards for a breed, diversity should still be possible for genes that do not affect the essential characteristics that distinguish one breed from another. If, in order to maintain breed identity, one has to compromise on genes that relate to general structural soundness, good health, intelligence, and temperament, perhaps this breed should not exist. However, as long as these essentials are not compromised, there is no reason not to have a diversity of breeds with different characteristics and capabilities. For those genes that establish breed identity, there will be markedly less variability within a breed than within Canis familiaris as a whole. The tricky bit is restricting variability for those genes that make a breed distinctive without sacrificing the variability/diversity that is necessary for good health and long-term survival of the breed. In many cases, this has not been achieved, and we are now paying the price in terms of high incidence of specific genetic diseases and increased susceptibility to other diseases, reduced litter sizes, reduced lifespan, inability to conceive naturally, etc. Many breeds have been established with too few founders or ones that are already too closely related. The registries (stud books) are closed for most breeds; therefore you cannot introduce diversity from outside the existing population. Most selective breeding practices have the effect of reducing the diversity further. In addition, the wrong things are often selected for.Even if the founders were sufficiently diverse genetically, almost no one knows how their genetic contributions are distributed among the present day population. Consequently, breeding is done without regard to conserving these contributions, which may be of value to the general health and survival of the breed. Is it too late for some breeds? Perhaps. Must we accept this as the final consequence of our breeding practices, I don't think so, there is still opportunity for change and reflection. We wish to acknowledge some sources of this material from John Armstrong and the Canine Diversity Project. ©2019 Siam Crown Kennel. All Right Reserved.